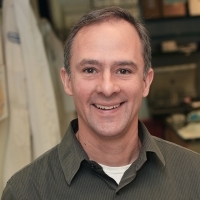 An award-winning researcher and associate professor of Cancer Biology at Fox Chase Cancer Center – Temple Health, Jeffrey R. Peterson, PhD, recently earned a $50,000 research grant from the Pennsylvania Breast Cancer Coalition (PBCC), along with his colleagues. The check was presented by Pat Halpin-Murphy, President and Founder, PBCC. Peterson and his team received the grant this past December. With the funding they plan to further explore metabolic reprogramming, a hallmark of cancer and an emerging therapeutic target. Peterson’s submission was selected as one of only four proposals to earn funding by the PBCC for 2016. Fox Chase provided the initial funding to help advance this project through a Translational Research Grant in 2015, and Peterson, the lead researcher in writing the proposal, acknowledged PBCC and Fox Chase for providing the funding his team needed to pursue this project. In preliminary studies, the researchers measured intracellular metabolites from a large panel of TNBC cell lines and controls, and found that TNBC cell lines, particularly those of the non-basal-like subtype, are highly dependent on the cellular redox buffer glutathione to prevent ferroptosis, a form of cell death. They hypothesized that “TNBC cells are teetering on the edge of the cliff of ferroptosis. By inhibiting the cancer cells’ ability to make glutathione, we think we can push them over the edge.” By contrast, normal breast cells appear to have plenty of glutathione, and therefore “sit well away from the cliff edge,” providing a way to selectively targeting the cancer. See more information about the 2016 research grant winners here. For questions or comments about this post, please contact us.